Anti- confederate Saturdays on the Boulevard!!! 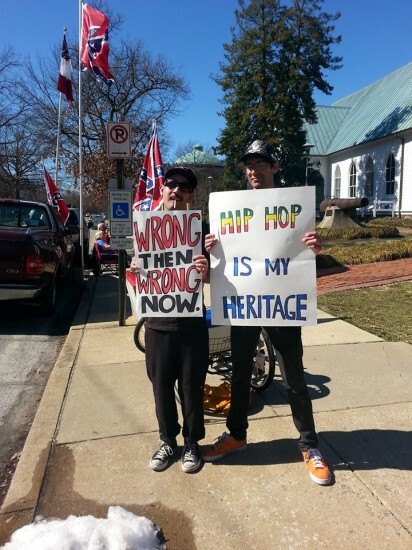 This demonstration stands in contrast to the Virginia Flaggers who, twice a week, demonstrate in front of the VMFA in protest of a 2010 decision of the museum to ask an adjacent property, which they lease to the Museum of the Confederacy, to take down a Confederate battle flag. Earlier this year, the group bought some land to erect a giant Confederate flag above I-95 Northbound, outside of the city. The type of flag shown above, and carried by the Flaggers, is not a friendly sight for many people in the South- it was used as a symbol by the KKK for approximately 25 times longer than it was used as a symbol of the Confederate States of America, an entity devoted to preserving the institution of chattel slavery, and it was a rallying symbol for the pro-school-segregation movement in the 1950s. If you missed the March Land Use committee meeting please watch several videos from the meeting taken by Silver Persinger. This is a link to one where folks speak in opposition to the leasing of Monroe Park. There are many more videos from civic meetings on Silver’s account. 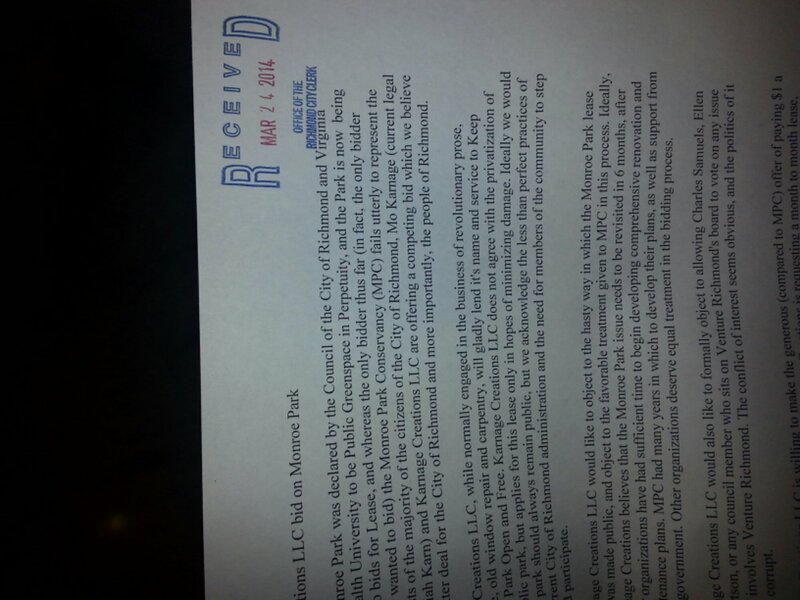 This bid was submitted to the City Clerk at 4:25 on March 24th in paper form. Whereas Monroe Park was declared by the Council of the City of Richmond and Virginia Commonwealth University to be Public Greenspace in Perpetuity, and the Park is now being offered up to bids for Lease, and whereas the only bidder thus far (in fact, the only bidder expected or wanted to bid) the Monroe Park Conservancy (MPC) fails utterly to represent the best interests of the majority of the citizens of the City of Richmond, Mo Karnage (current legal name Moriah Karn) and Karnage Creations LLC are offering a competing bid which we believe to be a better deal for the City of Richmond and more importantly, the people of Richmond. Karnage Creations LLC, while normally engaged in the business of revolutionary prose, childcare, old window repair and carpentry, will gladly lend it’s name and service to Keep Monroe Park Open and Free. Karnage Creations LLC does not agree with the privatization of any public park, but applies for this lease only in hopes of minimizing damage. Ideally we would think a park should always remain public, but we acknowledge the less than perfect practices of the current City of Richmond administration and the need for members of the community to step up and participate. Karnage Creations LLC would like to object to the hasty way in which the Monroe Park lease bid was made public, and object to the favorable treatment given to MPC in this process. Ideally, Karnage Creations believes that the Monroe Park issue needs to be revisited in 6 months, after other organizations have had sufficient time to begin developing comprehensive renovation and maintenance plans. MPC had many years in which to develop their plans, as well as support from local government. Other organizations deserve equal treatment in the bidding process. Karnage Creations LLC would also like to formally object to allowing Charles Samuels, Ellen Robertson, or any council member who sits on Venture Richmond’s board to vote on any issue which involves Venture Richmond. The conflict of interest seems obvious, and the politics of it seems corrupt. Karnage Creations LLC is willing to make the generous (compared to MPC) offer of paying $1 a month for the lease of Monroe Park. Karnage Creations is requesting a month to month lease, that way, at any time, the citizens of Richmond can, via Council vote, revert the running of the park back to the Parks and Recreation department. Karnage Creations LLC and Mo Karnage are well known members of the local community, with many years of organizing and networking experience. While financially we personally do not have much to offer, we have access to a much more valuable resource than money- the people of Richmond. We are fully confident that we will be able to organize and recruit the necessary donations and volunteers from a large variety of local businesses, non-profits, churches, and individuals. What we don’t know or have, people we know do or have, or know of other people who do or have. Their are many amazing, positive, talented, and smart people in Richmond that we would hope to make a welcoming space for collaboration of the betterment of Monroe Park and the community. We look forward to collaborating with many amazing people and groups in Richmond. It takes a village, and we happen to know one hell of a village. Karnage Creations will create a special department to deal with all of the Monroe Park business, named the Keep Monroe Park Open and Free Committee. Neither Karnage Creations, nor Mo Karnage, nor any member of the Keep Monroe Park Open and Free Committee, will ever be paid for their roles in the maintenance or direction of Monroe Park. No profits will be kept by any of the above named parties, and all profits will be returned to the Parks and Recreation department of the City of Richmond for the use in maintaining and improving other parks in the City. The Board of Directors for the Park will consist of 2 houseless people, 1 formerly houseless person, 1 unemployed person, 1 senior, 1 public housing resident, 1 person from each neighborhood surrounding the park (Oregon Hill, Jackson Ward, Carver, the Fan), 1 student, 1 Parks and Rec worker, 1 City Council member, 1 elementary school student, 2 people from organizations which serve free food or distribute free clothing. We are willing to adjust this make up if other people have more ideas! The board WILL NOT include anyone who is a member of the Vulture ahem Venture Richmond organization, unlike the Monroe Park Conservancy who shares 2 members directly with Venture Richmond, and has 7 other compromised members either through family, or their employer sitting on Venture Richmond’s board. The Keep Monroe Park Open and Free Committee will do it’s best to keep cash out of its control. As opposed to collecting donations, they will focus on collecting the items needed. We will ask for community support in the form of benches, seeds, mulch, playground parts, plants, and more! Renew Richmond a local 501c3 has agreed, via it’s director John Lewis, to partner with Karnage Creations LLC to create and manage edible landscaping in Monroe Park to provide food and community to the area. Both groups will maintain the edible landscapes and possible future community gardens and fruit/nut trees. 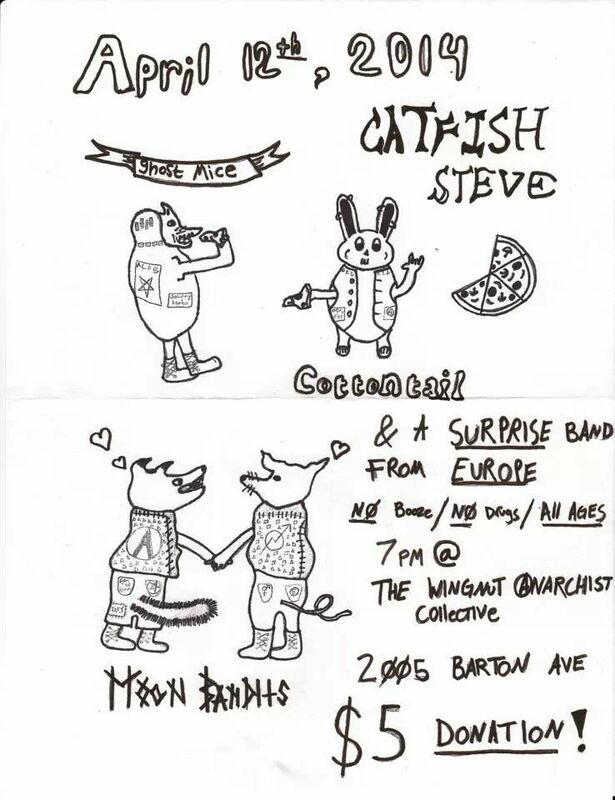 Karnage Creations LLC will donate it’s existing office space at the Wingnut Anarchist Collective at 2005 Barton Avenue for any administrative needs specific to Monroe Park outside of Parks and Rec. Therefor no additional funding will ever be needed for Monroe Park offices, unlike the $3000 a month MPC expects to spend. The Checkers Building will be renovated into a community commercial grade kitchen, to allow for all organizations who want to serve free food in the park a place to cook that food. Keep Monroe Park Open and Free Committee will help with the follow through of the City funded and mandated renovations of plumbing, electrical, bathroom and water fountain improvements, and pavers for the paths. Keep Monroe Park Open and Free Committee will organize volunteer work days to help with maintenance and leaf removal among other things. The volunteer work days should reduce the amount of paid maintenance necessary. The Keep Monroe Park Open and Free Committee will make legal guarantees that Monroe Park will not be used for parking. The Keep Monroe Park Open and Free Committee will allow food carts to access Monroe Park and/or the surrounding sidewalks in compliance with local city ordinances and policies. We will build no special amenities for these food carts. If we ever were to create a permit process for food carts on the paths in the park, it would be limited to 2 at any given time, and the money from those permits would go towards supporting the use of the Checkers Building as a free community kitchen for free food programs. 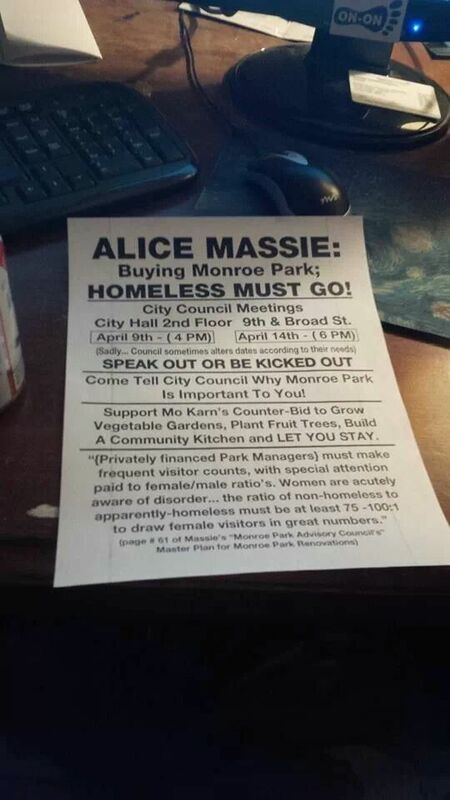 Keep Monroe Park Open and Free Committee will organize to have utility bills for the Checkers buildings paid for by various churches and other non-profits interested in and invested in the availability of the commercial community kitchen for the feeding of all. Keep Monroe Park Open and Free Committee will secure new benches, moveable tables and chairs, and community chess tables. Keep Monroe Park Open and Free Committee will organize the construction of a play ground in Monroe Park, returning the swings and other fun aspects to engage both the young and the young at heart in safe, healthy activity. 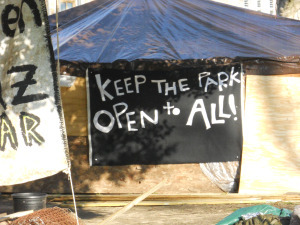 Keep Monroe Park Open and Free Committee will never hire or use private security in the park. The Keep Monroe Park Open and Free Committee will never fence off the park, and will work with any necessary contractors to ensure that a useable section of the park always remains open during renovations. The Keep Monroe Park Open and Free Committee will only ever charge a permit fee for events which themselves charge a fee. All money from these fees will go to the Parks and Recreation department. Events where no fee is charged will not be charged a fee, and will not be expected to apply for a permit. We will maintain a website, and a physical bulletin board in the park, where we will post dates of events in the park that we are aware of, that way folks can avoid conflict and overlap. The schedule for the community kitchen will be more officially organized just to make sure things run smoothly. The Keep Monroe Park Open and Free Committee will guarantee that no corporation or other organization will get naming rights to Monroe Park or Checker’s building. This will never be Altria park, no matter who donates however much. Monroe Park will be a park of the people and for the people. Popular public events such as the May Day parade, Halloween Parade, Critical Mass bike rides and more will be supported by the Keep Monroe Park Open and Free Committee. The Keep Monroe Park Open and Free Committee will do its best to ensure that Monroe Park will remain a safe and inclusive place for people of all classes, races, sexual orientations, abilities, gender identities, religions, ages, superpowers and more. We will work to improve the physical accessibility of the park. The Committee will work to provide free workshops in the park on a regular basis on a variety of relevant social justice issues. We hope to bring in outside organizations willing to donate their time to facilitate said workshops. The Keep Monroe Park Open and Free Committee will promote public art and work with local artists to have free workshops available regularly on a variety of artistic mediums and crafts. The Keep Monroe Park Open and Free Committee will work to maintain, renovate, and encourage a Monroe Park that is a benefit to the Richmond community. We will do this not just with corporate money or money from a few, but with the grassroots support from a wide swath of Richmonders, which will make our task far easier and more fulfilling than anything being attempted by the Monroe Park Conservancy. Some of the various documents and articles which we feel are vital to understanding our position, and why our approach will be more effective than that of the Monroe Park Conservancy for both renovating Monroe Park and also working in solidarity with the homeless to work towards a Richmond without a people without a home. We strongly believe that the methods of the Monroe Park Conservancy to remove homeless people from Monroe Park is both cruel and also ineffective. The way to solve any problem is to address the root causes of the problem. Otherwise we will be stuck moving homeless people from place to place around the city, which is an incredibly cruel thing to do to our most vulnerable population. 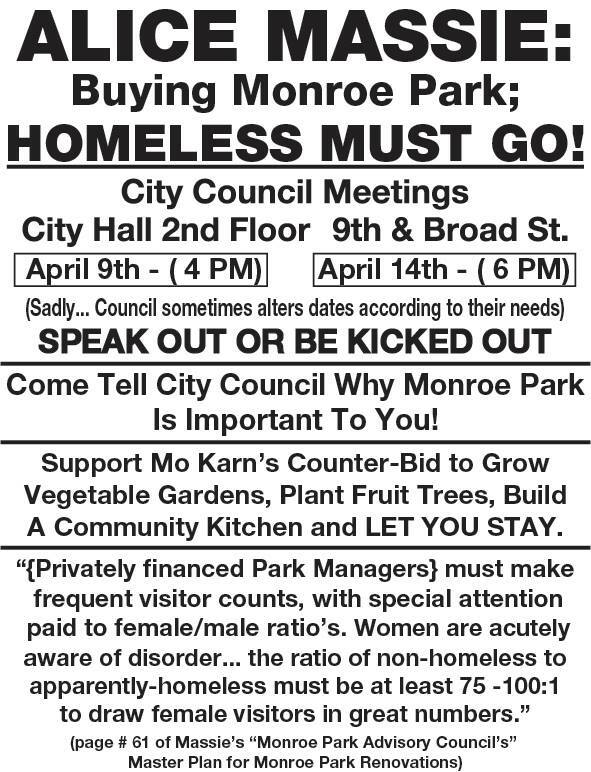 We would also argue that Monroe Park needs to remain a public area open to all – homeless and not, because non-profit organizations are not actually long term solutions to homelessness, and our dependence on them as a City puts our homeless at risk, especially in situations like with the Conrad Center, when it shut down last year. A public park should remain public, that way the homeless and others always have a place to congregate. This is a rough draft of a potential bid for the Monroe Park Lease, which is being voted on tomorrow by City Council. We will hopefully finalize and submit before 5pm in order to be allowed to present this to City Council for consideration. Support between now and tomorrow with edits or items we may have missed would be appreciated and can be mailed to mokarnage@gmail.com – Mo will be at work so replies won’t happen until after 3pm, and will need to occur quickly before printing. Thank you. Whereas Monroe Park was declared by the Council of the City of Richmond and Virginia Commonwealth University to be Public Greenspace in Perpetuity, and the Park is now being offered up to bids for Lease, and whereas the only bidder thus far (in fact, the only bidder expected or wanted to bid) the Monroe Park Conservancy (MPC) fails utterly to represent the best interests of the majority of the citizens of the City of Richmond, Mo Karnage and Karnage Creations LLC are offering a competing bid which we believe to be a better deal for the City of Richmond and more importantly, the people of Richmond.